In an alternative universe Los Angeles 1996 Sgt John Spartan (Sylvester Stallone) is on a crusade against warlord Simon Phoenix (Wesley Snipes). There is an explosive, unauthorised attempt by Spartan to save 30 bus passenger hostages, but they are killed. According to Spartan, they were dead before he entered the building. According to Phoenix, Spartan considered them acceptable collateral damage. Spartan is sentenced to cryogenic sleep and rehabilitation. In 2032, Phoenix escapes during a parole hearing into the megacity created by Los Angeles, San Diego and Santa Barbara. In this utopian city Phoenix caused untold havoc and the police haven't the training to fight him, so Spartan is revitalised -- a barbarian to catch a barbarian. He is partnered with a cop who has an illegal fascination with things past and violent (Sandra Bullock). 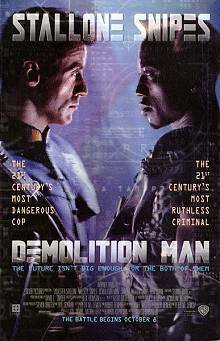 Demolition Man is a science fiction cop film with plenty of tongue-in-cheek extrapolations of the future. There are lauded peacemakers (Nigel Hawthorne) and rebel groups. There are people living clean and people living underground. It's a fast-moving fun trip into a future where one man's vision has created something clean, crime-free and dystopian.